What’s Next After San Juanico Bridge and Leyte Landing? But you know, there’s more to making a stop over at the San Juanico Bridge and at the Leyte Landing when it comes to visiting the two provinces that will really make you say General McArthur’s line. So, lemme tell you what’s more you can do on your trip. 1. 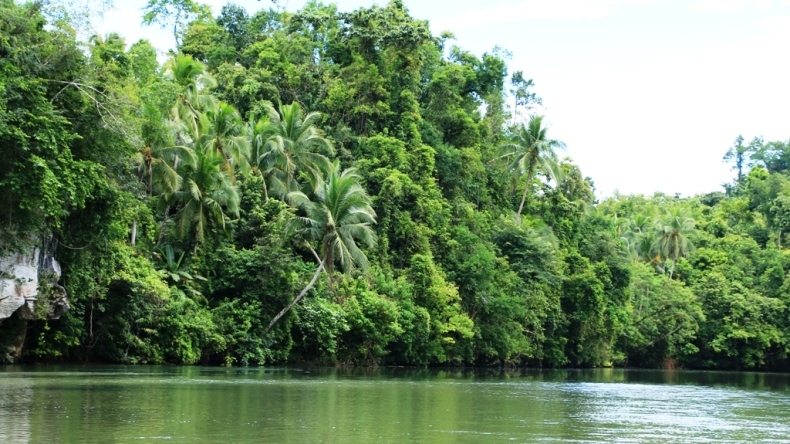 Get Wet and Go Caving in Sohoton! Get yourselves ready for some wet adventures! Head to Basey, Samar and visit the Sohoton Natural Bridge and Natural Park that has the Sohoton River and the Sohoton Cave. Before you even reach the river, your eyes will already have a blast with the rock formations and lots of greens along the way, as you have your first boat ride. The Natural Park is a protected area which is about 841 hectares and is famous for its natural stone bridge, connecting two mountains where the river stream flows underneath. Visitors can explore the area by kayaking. It’s either you row the kayak, or you just sit on it and let the guides row it for you while you take photos of the place. You may also swim along the river. The water is so refreshing and the current is also challenging. You can even hear the sound of the water! So be prepared and cautious! The Sohoton Cave is so enchanting. Aside from checking out the stalactites and stalagmites (do you even remember which is which? Stalactites are those formations above while stalagmites are those on the ground), lime stones, and marbles as you enter the left and right chamber of the cave, your imagination and creative thinking will be put into test. From the different rock formations inside, you can see different figures like a hand, wings of an angel, claws of the monkey-eating eagle, and a whole lot more. See it for yourself and hear the stories about these formations from the smart tour guides. Sohoton’s receiving area also has a dining place where you can order and eat which is run by the Sohoton Services Association. Even the tour guides are also part of the said association. So do not forget to bring extra clothes, and get your legs and foot wears ready for a dip and a walk along the Sohoton River and Sohoton Cave! The usual habal-habal is just a single motorcycle that has an improvised roof which is one method of transportation that our Waray Kababayans use. Now, one can explore Samar riding the habal-habal 2.0 that can cater 5-10 persons, depending on what type of habal-habal one would like to use. There’s this habal-habal that looks like tuktok of Thailand (their version of tricycle) while another looks like a mini police van but with a motorcycle in front. The seats of the police van look-alike habal-habals can also be changed. Passengers have the freedom to sit face-to-face or back-to-back, whichever they want! These habal-habal 2.0s are a lot safer for the passengers to ride on. You probably need some vitamin sea. Yup! VITAMIN SEA. Sabang Daguitan Surf Camp in Dulag, Leyte has that kind of vitamin you are looking for. Other than taking a swim, give yourself a level up. Try surfing! The waves are calling, sweetheart. It’s also the time to learn something new if you haven’t tried to go surfing yet. Surfing lessons and surf boards are available. But if you don’t wanna get wet, you can just play beach volleyball or build sandcastles. You may also just sit by the shore and enjoy the breeze. Relax and take your mind off the city life. After surfing, you can also eat your lunch at their dining cottage. They have different meals. You can eat susô here! Ginataang susô. 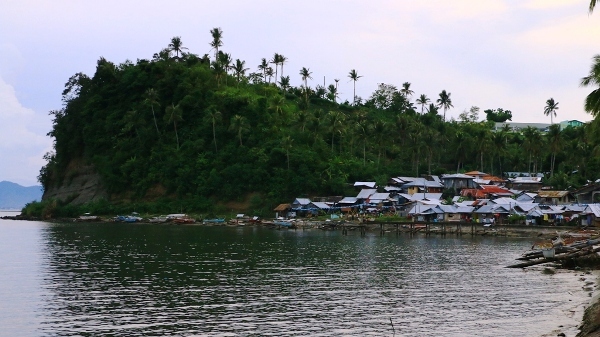 Locales of Sabang Daguitan have their own way on how to eat it easily. They will teach you how. 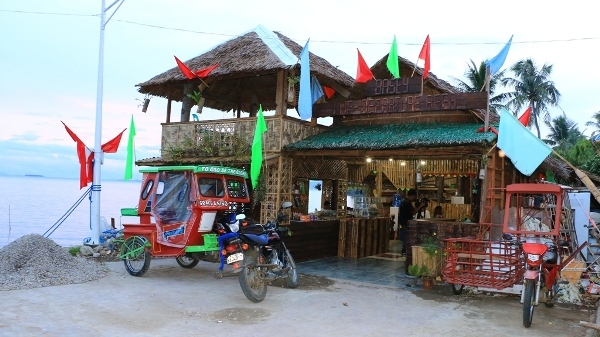 Sabang Daguitan Surf Camp also has cottages for sleep overs or staycations. 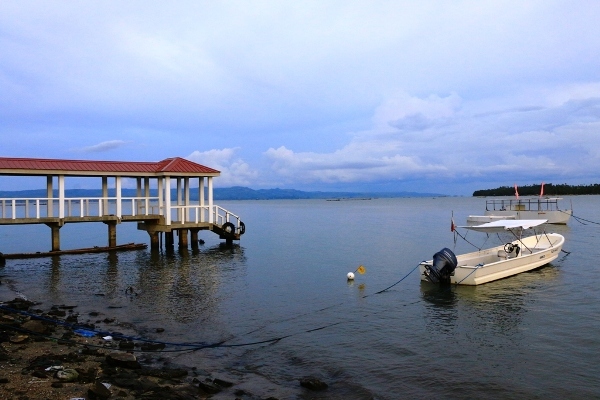 If you love challenge, you would love going to La Cucina de Marabut in Marabut, Samar. Because before you can get to the place where you would eat, you have to cross a bamboo boardwalk and a farm. You would definitely love the nature! You don’t get to walk across the fields in the city, right? Once you get in La Cucina, you get to have healthy and organic food. They have their own organic garden. Organic squash, organic watermelons… They also have their own vermin compost. You don’t only get to dine; you also get to see an organic farm! During our stay, we were able to savor the Relyenong Alimasag which is a lot easier to eat, no need of too much breaking the crab’s skeleton because they shredded the crab’s meat in the process and mixed it with a little of egg. Add the tasty Liempo and Kinilaw na Puso ng Saging. Yum! Yum! If you’re not into some surfing action, like, you don’t wanna have fun by caressing the waves, you can just play along the shoreline with a skim board. This can be done in San Jose Skimboarding Camp. The skimboarding camp is easily seen as it is just along the high way. They also prepare healthy and delicious food for their guests but you can bring your own. Aside from skimboarding, you can just sit on the sand and use your creativity to come up with different things just like this, playing with your camera – trying to catch humans. Of course, your family, barkadas, and loved ones will be waiting for your pasalubong! Instead of buying something expensive from the malls or in the souvenir shops, just visit the office of the Basey weavers. Their office is actually a tourist spot, too – the Saob Cave in Basey, Samar. Here, you can buy different hand-woven mats. Yes, they are hand-woven. Meticulously done with the hands of the lovely and industrious weavers. Aside from mats, you can also grab some bags, wallets, and pouches, with different colors and designs. You also get an extra treat because you can see how they weave those mats. How they pound the tikog grass, the main material in making the mats and bags, and listen to their own personal stories on how weaving has changed their lives. Did you know that some of them already have children who graduated just because of their income from weaving? It isn’t everyday that you can eat your lunch, your dinner, or even your merienda while over-looking the majestic view of the sea. The Basey Pre-Departure Area in Basey, Samar has that kind of ambience. The whole diner is made of nipa and bamboo. Their meals are also affordable, ranging from 15 pesos to 50 pesos for veggies and viand while 10 pesos for a cup of rice. Yeah! Like your nearby carinderia. 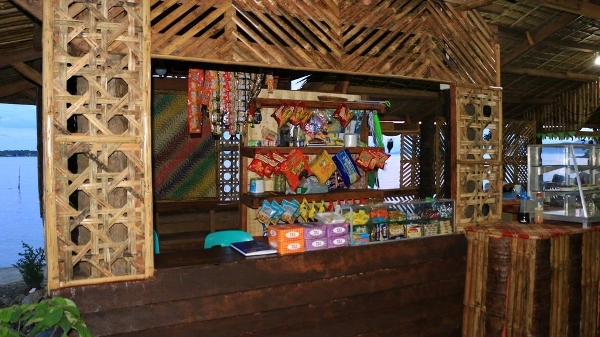 They also have a mini sari-sari store where you can buy chips. By the way, the servers in the diner are all men. Soon, they are also planning to have a massage and barber area. Basey Pre-Departure Area is definitely not your typical dining place. So aside from taking pictures of the San Juanico Bridge, or giving a salute or shaking hands with the soldiers in Leyte Landing, you can also have more adventures with this list when you visit Samar and Leyte. You do not only get to take photos of your trip, but you also engage yourself to the community. Most of all, the best thing about travelling to these places, is you get to help the people who are working at the area. All of these sites are being managed by people’s organizations which benefit from the project or the livelihood. Livelihood has been one of the most focused projects of ABS-CBN Lingkod Kapamilya Foundation, Inc. Aside from giving people the materials and the infrastructures, the organization also gives them the technical know-how to come up and manage what has been given to them. They are also assisted to where and to whom they can market their products and services. A holistic approach. With these livelihood opportunities in the community, ALKFI aims to sustain and uplift their lives, after their dreadful Typhoon Yolanda experience. Always remember the old Chinese Proverb, Give a man a fish and you feed him for a day. Teach a man to fish and you feed him for a lifetime. For more information on these tours, contact G Eco Tours at (02) 904-5066 or email at [email protected] You may also e-mail Bantay Kalikasan, ALKFI’s program that oversees these sites at [email protected].